Nerds In Love: "...But its going to be okay"
The title is a quote from our favorite article about the ISS ammonia leak that popped up on us Thursday: "The space station is leaking vital fluid, but its going to be okay"
That headline became our motto in the 2 day sprint to Saturday morning's EVA. 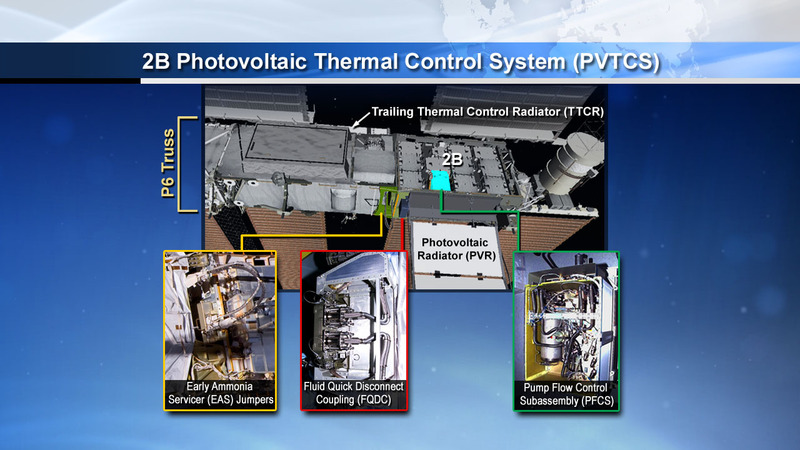 The leak was in Photovoltaic Thermal Control System 2B, one of 8 such systems on station, which cools one of our 8 power channels. It would be simplistic to say that this is 1/8 of our power generation, which is pretty much true, because 2B is a special channel. It powers more important stuff (aka critical loads) than any other. As NASA's own briefing site explains, rather than lose those loads, we performed what's called a seamless power channel handover. This configures the dying channel's loads to be hosted by another channel. (As the word seamless implies, we can do this without powering down the loads.) We are still down 1/8 of the power generation capability, but retain power to critical loads. 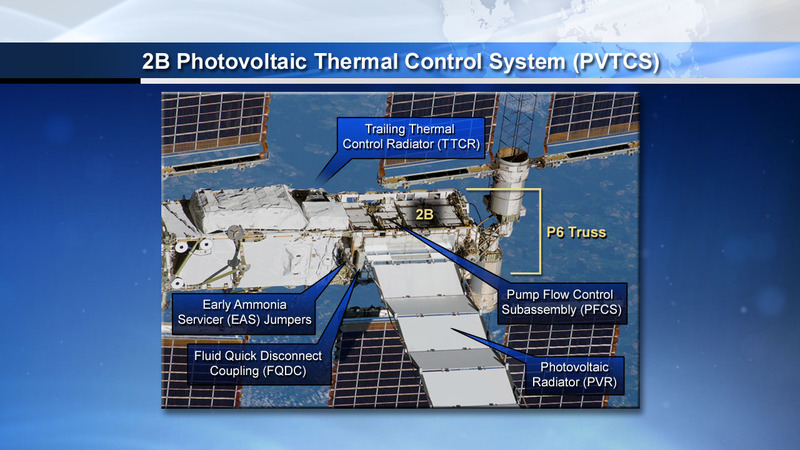 After that, we powered the leaking loop down and configured channel 2B for dormancy. The email came out to the group that PVTCS 2B quantities had taken a sharp downturn... aka were leaking at a much faster rate than we had been tracking since before I even started at JSC. I left work Thursday afternoon around 5, and headed to happy hour with some friends prior to a softball double header with our co-ed recreational team. Just as we were leaving the restaurant to go to softball, I got a call from my boss. The EVA lead team for our group was staying late working on the EVA plan; they had to sleep sometime and there was another meeting scheduled at 3am that they needed me to cover. Dan and I had carpooled, so he drove me home, missing the first game but heading back for the second. I obviously missed both games, took some Nyquil and went to bed getting about 4.5 hours of sleep before my 1:30am wakeup call. While I was sleeping, and into when I arrived, the on console team (including someone spun up Thursday afternoon to head straight to bed to support the night shift) performed the seamless power channel handover and channel dormancy procedure. I attended the EVA coordination meeting, and then I hit the ground running on various EVA prep tasks. Among them I worked on much of the timeline for our supporting activities, wrote/updated 3 procedures for various EVA related operations, and even spent an hour sending some commands to ISS. After a long 12 hours, I realized I had to pee. True story, I spent 9 hours in a chair, tied to a console, and never got up to pee. And I ate a giant bag of pretzel M&Ms and a doughnut for lunch. Oops. We headed to bed early- Dan because he had to get up at 5 to drive to a karate event in Dallas, and me because I had been up since 1:30 and had to get back around 5 the next day. Crew successfully installed the new pump assembly and was headed back to the airlock. We realized that it was just 48 hours since we started the whole thing. I spent more than half of them at work and am amazed how much we accomplished in such a short time. Now we are just waiting to see if that stopped (or at least slowed) the leak so we can keep the loop. Yup, pretty much EVERYONE in my group had a hand in the planning and execution of this amazing feat- planning and executing an EVA in 24 hours. I was on the front lines, but no less than 8 people IMed or emailed to offer whatever help they could provide. And they took the assignments I fired off at them and did them perfectly. I'm proud to work with so many people dedicated to the manned spaceflight cause. One other observation: This was made possible not just due to extreme dedication and sleep deprivation by many many Spartans, but due to the amazing powers of the internet. I can't imagine doing everything we did in 48 hours without being able to so easily share all the information we needed. When I went to bed on Thursday night, I woke up 4 hours later to a complete handover from the guys who had just gone to bed a few hours before in my cell phone inbox, information necessary for me to get anything done before they all came back the next morning. Email has truly revolutionized flight control (and our lives in general) and I'm just amazed at what it has enabled us to do.